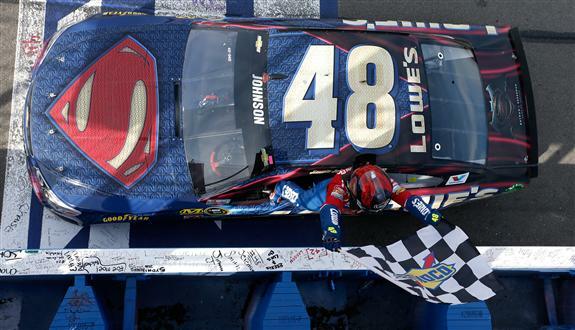 FONTANA, Calif. – Jimmie Johnson won the battle between hometown heroes on Sunday, outdueling Kevin Harvick in overtime at Auto Club Speedway. The six-time series champion from El Cajon got the chance he needed when Kyle Busch blew a tire and hit the Turn 3 wall on Lap 198 of a scheduled 200 to cause the sixth and final caution of the afternoon. With the race destined for overtime, the lead-lap cars came to pit road for new tires, with Denny Hamlin leading Harvick and Johnson back onto the track. Hamlin chose the outside lane for a restart on Lap 204, leaving Johnson behind Harvick in the inside lane. Johnson pushed Harvick clear of Hamlin into Turn 1 and dived to the inside of the race’s dominant driver, who had led 142 laps to that point. Johnson stayed in the gas off Turn 2, ultimately clearing Harvick and pulling away to win by .772 seconds. The victory was Johnson’s second of the 2016 season and his sixth in 22 starts at the two-mile track. “I got a great run off of Turn 2, and I thought ‘Man I’ve got a shot at this thing,’” Johnson said of the opening lap of the final restart. “Which I didn’t expect to have. Harvick has been so fast. I cleared him and kind of got away. Driving a No. 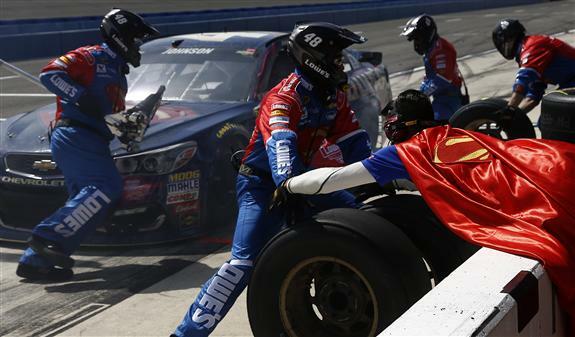 48 Hendrick Motorsports Chevrolet adorned with a “Superman” logo to plug the movie “Batman v. Superman: Dawn of Justice,” Johnson led 25 laps, but his rival from Bakersfield had dominated the event until the final restart. “We weren’t very good on restarts for four or five laps, unless we were all by ourselves,” said Harvick, who nevertheless retained the series lead by 11 points over Johnson. “The No. 48 was able to hang with us, and we just weren’t able to drive it in like I needed to, just didn’t have the front tires turning and the back wouldn’t grip. Hamlin ran third, overcoming radio problems that left him mired in traffic early in the race. Joey Logano ran fourth, followed by Ricky Stenhouse Jr., who notched his first top five since last year’s spring race at Bristol. Rookie Chase Elliott, Carl Edwards, AJ Allmendinger, Brad Keselowski and Jamie McMurray completed the top 10. Polesitter Austin Dillon finished 24th, after a loose wheel forced him to return to pit road after stops under caution on Lap 110.